Fill a large 12 inch skillet nearly to the rim with water. Add the vinegar and salt and bring to a boil over high heat. Once it comes to a boil, remove off heat. Once your eggs are in the skillet, cover the pan and poach the eggs until whites are set but yolks are slightly runny, about 5-7 minutes. Using a slotted spoon, transfer eggs to a paper towel-lined plate. Meanwhile, preheat your broiler. Arrange your toasted English muffins, split side up, on a baking sheet and place a slice of bacon on each. Broil until they begin to brown, about 1 minute. Arrange 1 poached egg on top of each English muffin. Spoon 1-2 tablespoons of hollandaise sauce over each egg. Garnish with minced fresh parsley and serve. Whisk butter and egg yolks in a large heat resistant bowl set over a medium saucepan filled with 1/2 inch of barely simmering water. Be careful not to let the bottom of the bowl touch the water. Slowly add the 1/2 cup of boiling water into the bowl and cook, whisking constantly. It will eventually thicken when the sauce registers 160 degrees, in about 7-10 minutes. Remove from heat and stir the lemon juice and cayenne if using. Season with salt to taste and serve over eggs benedict above. Wow! This is so colorful! I want something like this to be on my table during breakfast. Mm, this looks like a delicious breakfast! 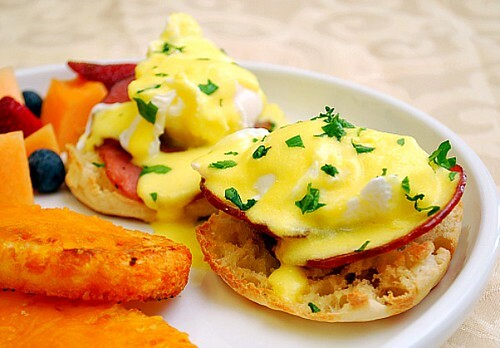 Eggs benedict is my favorite breakfast, too. The traditional version is always a winner, but I also like a crab cakes florentine version. This easy hollandaise sauce makes any combination possible. That's the key ingredient. Yum! Ohhh my favorite breakfast too!! I'll try your foolproof version of Hollandaise! sounds great!